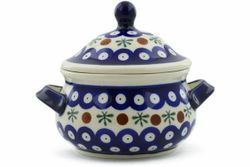 Polish pottery Bullion Cups / Soup Bowls with lids will make the perfect addition to your dinnerware collection. Each stoneware bowl is beautifully hand-painted by talented artisans from Poland. These small stoneware soup bowls are great for serving a variety of hot soups, bouillon, chili or chowder.